Even though there weren't many new releases this Summer, AnTuTu's top 10 fastest smartphone list has two brand new additions. However, the first place is still occupied by the Xiaomi Black Shark gaming smartphone. Interestingly, the second place is now taken by the newly released Meizu 16 Plus, which also boasts some kind of a heat spreader that appears to be doing its job pretty well. 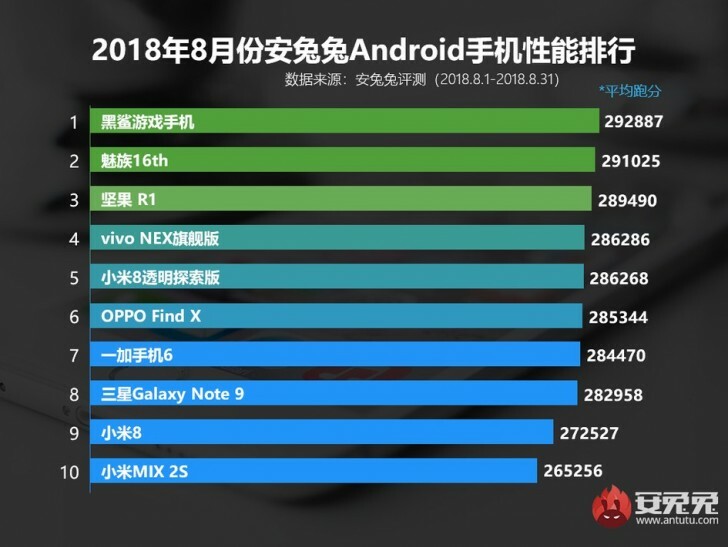 Back in June, the third place was taken by the OnePlus 6 but now it goes to the Smartisan Nut R1 followed by the vivo NEX, Xiaomi Mi 8 Explorer and the Oppo Find X. The Galaxy Note9 has also joined the party as it was released just last month. And it's not a surprise to see it among the fastest phones. Of course, all of these devices share the same SoC - Snapdragon 845 and the score difference is marginal. It all comes down to software optimization, driver updates and heat management. I wish rog phone was on the list. Sorry fanboy. You have failed to refute my argument. Please read my comment again.